A brief introduction to the Simpson’s 1/3rd rule and a uniform interval Composite Simpson’s 1/3rd Rule implementation. The Simpson’s 1/3 rule is a numerical method to find the integral within some finite limits and . Simpson’s 1/3rd rule approximates with a polynomial of degree two , ie. a parabola between the two limits and , and then finds the integral of that bounded parabola, and is used to represent the approximate integral . The integral of the approximated function is the area under the parabola bounded by the points and and by the positive side of the x axis. The quadratic function has three points common to the function , which are as follows: The end points of the approximate quadratic function is the same as the function at , . And takes the same value of the function at point . Thus three points are fixed each in equal interval and a parabola is drawn through these three points and the area under the parabola through these points bounded by and and the positive side of the X axis is found, which is used as the approximated integral value. The below iterative formula an be used to find the integral of a function using Simpson’s 1/3rd rule. 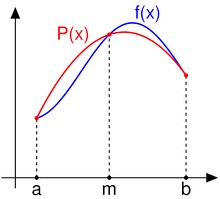 Simpson's rule can be derived by approximating the integrand f (x) (in blue) by the quadratic function P (x) (in red). The Simpson’s Composite Rule function will calculate the first and the last ordinate separately and also calculate and sum up the odd and the even ordinates separately for better clarity, and at last the Simpson’s Composite Rule iterative formula would be used directly. The two given function defined in the previous section is implemented with the functions f1 () and f2 (). These two functions accept a double type data, and returns double. double f1 (double x) : This function implements the equation sin (2 * x) / pow ((1 + x), 5) and returns the evaluated value. double f2 (double x) : This function implements the equation (1 / x) + 5 + 10 * x * x and returns the evaluated value. int main (void) : The main function prompts the user to enter the upper and the lower limits and the number of intervals to be taken and calls the functions with the proper parameters. The simpson_13() is called as Is = simpson_13 (f1, a, b, n); which computes the integral of the function f1 within upper and lower limit a and b with the Simpson’s 1/3 rule. The magnitude of the Simpson’s rule error decreases as the the step size is decreased as the function is better approximated with the second degree equation. ans = simpson_13 (parse_expression (user_expression, x), a, b, n) ; the ‘user_expression’ is being considered a single variable function with the variable replaced with the value of ‘x’ . how do you apply composite simpsons 1/3 rule for double and triple integrals where h=(b-a)/(2n) and k=(d-c)/(2m) and J=(g-f)/(2p). A parabola is fit taking two successive intervals. So there are total n/2 elementary parabola.